The charming guesthouse, 'Casa de Huéspedes Gundi y Tomás' has for 25 years been one of the area's premier secret destinations for guests from around the world. The German owner, Gundi, runs the pension with her two sons and their friendly Mexican crew. 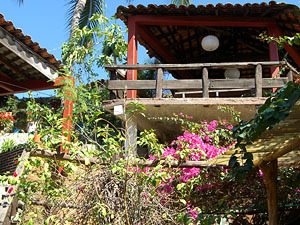 This oasis on the hill in the sleepy center of Puerto Angel entices beautiful Mexican dreams as you lie in a gently swinging hammock on the airy sea view terrace surrounded by tropical plants, Or you can sip a cool beverage in the relaxing company of other travelers from all over the world. Whatever your preferences, come visit us soon and stay awhile. In our restaurant we offer a variety of breakfasts and lunch and serve fresh fish daily with home-made bread. We offer 16 rooms in three different houses and a bungalow, built and decorated in the Mexican style, and adapted to the landscape.